This week I was delighted to be part of a small group of residents from the Hills Road area invited to a meeting with the County Council’s Cycling Projects Team to discuss the progress of the cycleway projects along the road. It was an informative meeting, and I’d like to commend the council officers for bringing us all together. You’ll notice that if you want to find out more, you’re supposed to go to Shire Hall and ask. There’s no indication that there’s an explanation of the proposed scheme online, or in the library. You’ll also notice that you’ve got until next Wednesday (5th April) to object. “I have consulted with some neighbours and find opinions split. “In our house, we feel that this may just add to unenforced rules which make life difficult for everyone without really improving safety. We note that the white posts prevent vehicles from pulling off the road so the sedum is protected but cyclists are not, which seems at odds with the stated aims for the cycleway. “Requiring delivery companies to operate outside peak times will substantially affect their delivery routes and businesses. Concentrating deliveries during non-peak hours may even out congestion (by reducing vehicles at peak times but adding them at other times) but I am not sure if that is good or bad. Surely requiring delivery vehicles to use driveways where they are available would be a more logical step. It sounds as if there would be many exceptions, which would muddy the picture further. “We are part of a Cambridge fish club and receive fresh fish from Cornwall first thing in the morning; I would be very sad to lose that service. 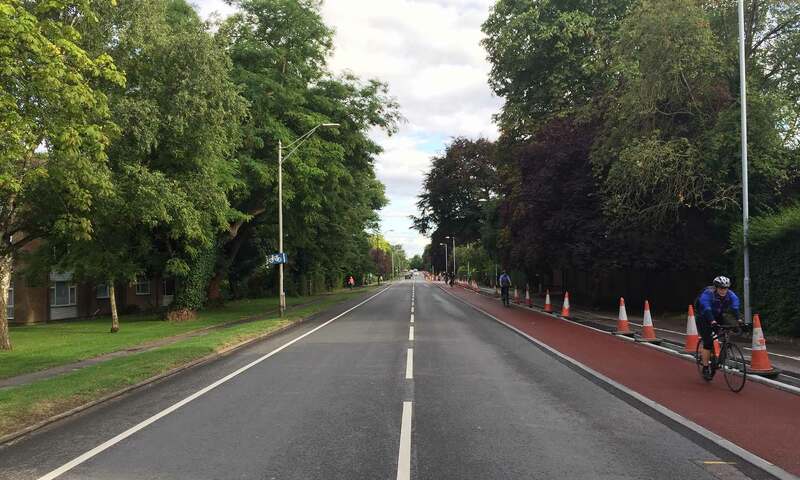 “You say a similar scheme in Gilbert Road works ‘reasonably well’; how has the current proposal been adapted to improve on the Gilbert Road experience? The residents who discussed the issue assumed the council would come back to them, addressing any problems raised, and that as a next step, the information could then be disseminated more widely to neighbours. Sadly, I am not aware that any received a response. The next development was the notices on the lamp-posts. Now those residents who object to the plan, or want to see it discussed further, have just a few days to email the council with their views, and no suggestion that what they say will have any effect. Our councillors don’t seem to have been very engaged; one tweeted about it earlier this month, without saying there was a consultation running. That’s all I can find. Again, it seems that even when council officers start off with good intentions to get residents involved, things end up in a mess. What can we do? 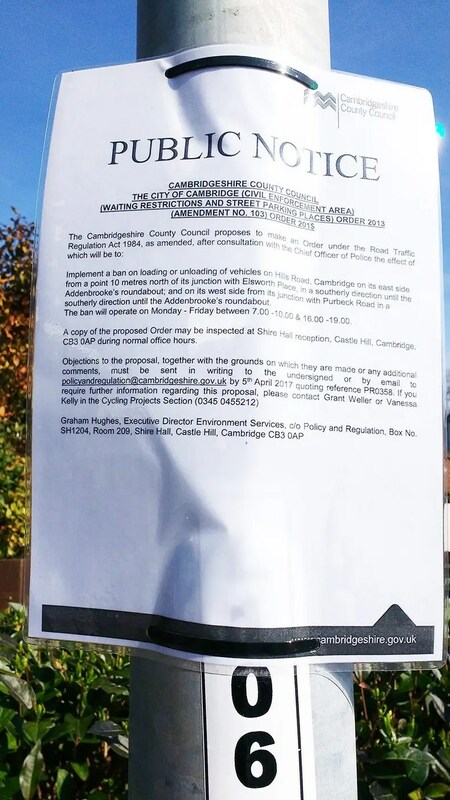 As stated on the lamp-post signs, if you want to object to the proposed Traffic Regulation Order, you should email policyandregulation@cambridgeshire.gov.uk quoting ‘PR0358’. To talk to a council officer, call Grant Weller or Vanessa Kelly on 0345 045 5212. Thank you for picking up on this Chris. As far as I can discover, there has been no attempt to answer any of the completely valid safety and amenity-related queries which arose from the first round of discussion in late 2016. Residents have now been presented with a scheme with many questions still outstanding – are those specific hours of operation reasonable and proportionate? Who exactly is exempt from the scheme – I’ve seen mention of ‘postal deliveries’ but does that just mean Royal Mail or does it include courier companies? How feasible is it to tell people working away the home during the day that they will be limited to receiving deliveries only before 7am or after 7pm? And so on. Asking these questions does not mean that residents automatically oppose any scheme, or even this scheme, but they do quite rightly want to understand in some detail what the actual impact will be on their day-to-day existence. Moreover, if the County Council want to claim that this current consultation period is the time when people should be raising their concerns, it is beholden on them – and local councillors – to make the effort to let residents know what’s proposed, how it might affect them and how they should go about responding. And that doesn’t mean just sticking laminated sheets on lampposts! The only reference I’ve seen to it in any councillors’ social media is a solitary tweet by City Councillor George Pippas on 10 March: “The CCC proposes to Implement a ban on loading or unloading of vehicles on Hills Road. The ban will operate on Mon-Fri between 7-10 & 16.00-19” I replied to this asking for details but got no further with unpicking what was going on. George’s tweet was retweeted (no comment, no clarification) by Amanda Taylor the same day. And that’s it. Radio silence ever since. Seriously, how are people supposed to know about this stuff? There has been a significant failure of process here. The County chose to contact Hills Road Residents Association initially, but having asked for their input didn’t see the need to engage with the content of their replies, or to tell them that the consultation was starting. They didn’t contact the Queen Edith’s Community Forum at all, even though they know that it reaches hundreds of local people through its newsletter, website, mailing list and Facebook page. And we didn’t chase it up proactively with officers because it seemed blindingly obvious that the next step would be that officers and/or councillors would get in touch with us when there was something more to say. I am really disturbed by the fact that, at a time when this area is coming under acute pressure from development, residents are still left to find out what’s going on by a process of Chinese Whispers, or happening to be included on the right email thread or subscribe to the right Twitter account. We’ve been round this loop time and again on the Hills Road cycleway scheme but nothing seems to be changing. In relation to this particular TRO, the HRRA and QECF will be writing to councillors and officers today to lay out our understanding of the sequence of events; seek an explanation of how we have arrived at this impasse; and ask what they propose to do about it. My own preference would be that they offer to extend the consultation deadline by a month and publicise it thoroughly this time. What to do about the attitudes which are the root cause of these repeated communications failures may be less easy to resolve. The information in this email is confidential and may be legally privileged. It is intended solely for the addressee. If you receive this email by mistake please notify the sender and delete it immediately. Opinions expressed are those of the individual and do not necessarily represent the opinion of Cambridgeshire County Council. I had received two attachments with this email one was a copy of the notice that I later saw attached onto the lampposts, and the other one is the map showing the location. The email was addressed to me alone, I could see nobody else copied on it. I am not sure if any other Councillors were notified. Did officer Marshall send me this email as South Area Committee chair and ignore all the other Councillors? Cambridge Local Government acting just as Cambridge Local Government is now accustomed to doing. Thank you for raising this Chris. However, aren’t we all, residents, in effect powerless? Powerless, yes. I tried to comment on what my thoughts were on the new cycle way (Very negative)through the link given in Focus – but the link doesn’t work. At least it didn’t for me and I tried several times. Since no notice is taken of the public’s comments, I stopped wasting what little time in life is left to me, threw the Focus sheet into the recycling bin and thought sadly how helpless we are,as we see trees and bushes removed, intolerable traffic jams even at the weekends when no work is being done on the ruination of the Hills Road/Long Road. QE Way crossroads and shudder to think what a deeper mess we will all be in when the link between the Hospital roundabout and Long Road will be closed for an optimistic 4 months. Knowing past records, a year may be a better forecast. I am not going to vote any more – democracy is dead. No, I don’t believe we are powerless. For example, in March 2016 the Independent Complaints Investigator at the City Council upheld all three complaints against the City Council made by residents who argued that there had been a breach of process in the handling of a consultation over Petersfield Green. It would be tiresome and annoying to have to go down that sort of route with the County Council, and one would hope that reasonable people would be able to arrive at a reasonable compromise without outside intervention, but nevertheless such options do exist. I can understand why the County Council wish to impose this – it is an attempt to keep traffic flowing up Hills Road during peak times (for all road using commuters). There is a balance of interests that runs far wider than Hills Road residents. In this instance, meaningful “local” consultation (implying feedback will make a significant change to this binary decision) is highly limited. Informing the residents and Councillors is another matter – the information arrived after the decision had been taken. How much will it affect local residents? It will clearly have an impact, but probably not a large one. Most deliveries occur outside this time as it is not cost-effective to deliver in peak traffic congestion. For deliveries during peak travel time, the deliverer will need to turn, across the cycle lane and footpath, into resident’s drives – deliveries can still be made. If turning in the drive is not possible, backing out may be an issue. Personally I don’t believe the ban will make any difference to commuter travel time – there are long waits before Hills Road, and after Hills Road – but it may reduce commuter frustration. Based on mere observation and personal experience the unloading ban seems to be working well. It benefits the many cyclists in peak times as they do not have to skirt around vans parked for deliveries. Delivery companies seem to have adapted, for which they should be commended. I hope that any residents that have critical deliveries that can only take place during peak times are being accommodated, by for instance arranging for vans to be able to pull off and turn in driveways. Understandably delivery vans are reluctant to pull into driveways without such arrangements for fear of having to reverse out so this could not be a standard practice. Deliveries during off peak times enable van drivers to have more time to consider the damage they can cause to the sedum strip and verges so that hopefully we will see less of this. There is likely no data on the impact on residents who are not at home between 10am-4pm but hopefully they are coping, through deliveries left in safe places or with neighbours, as they have before. We may well have issues with the consultation process but the implementation seems to be providing benefits to road and cycle way users and, by reducing throughput and frustration, to residents. Any decrease in traffic hold-ups is also to be welcomed during the onerous but necessary work on cycle path development stage 2.